In late November, WordPress.com rolled out a a brand new Media Manager, to make it easier to upload and edit images, videos and audio on your WordPress-hosted website. Almost three weeks on, a couple of new updates have hit the Media Manager tool, perhaps the most notable one being that you can now enable a slideshow in Media Manager. Slideshow lets you include a range of specific images, which can be reordered by dragging and dropping thumbnails. You can also opt to randomize the order by checkmarking the Random Order box, or even reverse the order of images by clicking Reverse Order. Similarly, you can exclude certain images from a slideshow by clicking the slideshow in Visual Editor until the Edit Gallery icon displays, then click it to begin editing the gallery. 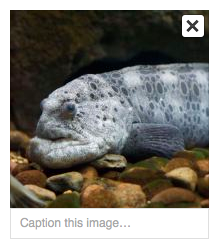 Hit the X button on any given image to remove it from the slideshow. It’s also worth noting you can insert multiple slideshows into a single post or page, just as you’re able to do with galleries. While the old slideshow shortcode will still work on your WordPress.com site, you won’t be able to access these new features unless you update your shortcode to the new format. In addition to slideshows, the latest Media Manager update means you can now set your gallery-type too, through the same dropdown menu outlined above. 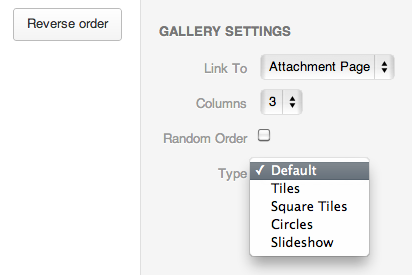 You’ll note the following list of layout options for your gallery: Default, Tiles, Square Tiles and Circles. You can read more about these changes on the dedicated slideshow and gallery support pages.